These beautiful Christmas ornaments are made of durable and sturdy plastic - perfect for indoor and outdoor. 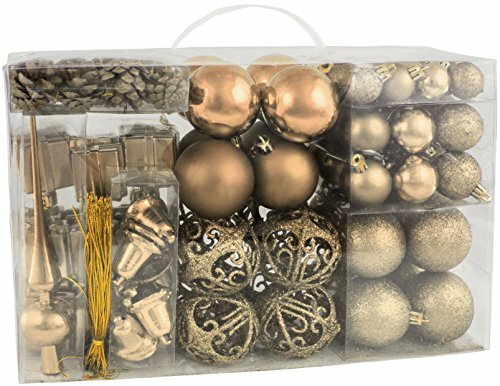 This XXL set contains 102 ornaments in total: 58 Christmas balls, 8 Christmas bells, 18 little present boxes, 16 pine cones, 1 tree topper and 1 traditional German green pickle (made of glass, not shatterproof). Great as a perfect gift to others or yourself. Comes in a reusable plastic gift box. The shatterproof plastic ornaments combine the beauty and luster of real glass with the unbreakable practicality of plastic. Designed in Germany with our traditional German green glass pickle. Make sure to hide it within the tree - whoever finds it is entitled to an extra present. Material: High quality plastic. Pickle made of glass. Designed in Germany - Our Christmas tree ornaments feature a variety of traditional and very popular Christmas elements. They will become a perfect part of your holiday tradition. Child and pet friendly - Our Christmas tree balls are made of durable and environmentally friendly plastic and offer an excellent break resistance. Never gets old - Our set of over a hundred Christmas tree ornaments come in a variety of traditional Christmas colors and can be used every year. The whole set comes in a reusable plastic storage box. Designed in Germany with our traditional and original German green pickle (made of glass). Make sure to hide it within the tree - whoever finds it is entitled to an extra present.